Simultaneously a beautiful study of human life mired in great adversity and a lost opportunity for revealing the intricate depths of theological thought in Nazi Germany, this film foolishly sacrifices its greatest potential asset: the wonderfully rich theological writings that justify Dietrich Bonhoeffer as a subject suitable for general interest. We have for once learned to see the great events of world history from below, from the perspective of the outcast, the suspects, the maltreated, the powerless, the oppressed, the reviled, in short, from the perspective of those who suffer. Mere waiting and looking on is not Christian behavior. Christians are called to compassion and action. - Dietrich Bonhoeffer. Dietrich Bonhoeffer is probably not a name that figures prominently in your historical awareness -- that is, unless you are a student of theology. Born in 1906 to a well-to-do family in Breslau, Germany, Bonhoeffer grew up in a privileged district on the outskirts of Berlin. He lost an older brother, the 18-year-old Walter, to the First World War, a loss that led Bonhoeffer toward religion and pacifism. 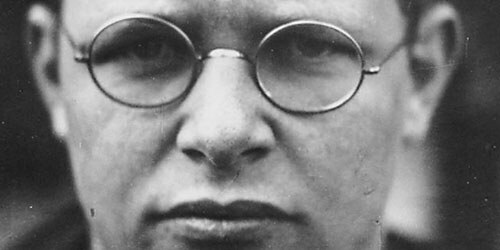 The Bonhoeffer family was not particularly religious and therefore were somewhat surprised by Dietrich Bonhoeffer’s decision to study theology. He earned his doctorate in theology from the University of Berlin (completing his dissertation when he was only 21 years old) and then studied further in New York City at the Union Theological Society. 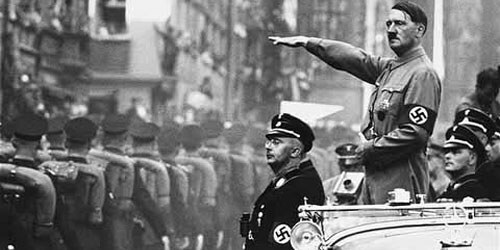 Returning to Germany in 1931, he soon became a relatively outspoken critic of the emergent National Socialist party and the rise to power of Adolf Hitler. He helped establish the Confessing Church and was the head of an illegal seminary for the Confessing Church in Finkenwalde and then later at the von Blumenthal estate. Eventually he became involved with the resistance group based in the Abwehr (the Military Intelligence Office) that plotted to overthrow or assassinate Hitler. He was arrested in April 1943 for conspiracy and executed two years later just as the Third Reich crumbled. 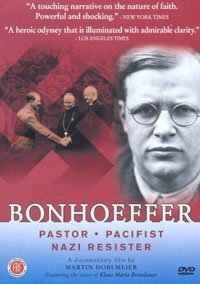 Martin Doblmeier's 2003 documentary, Bonhoeffer: Pastor, Pacifist, Nazi Resister, sketches the life of Dietrich Bonhoeffer through a combination of narrative biography, quotations from his various personal and theological writings, and interviews with numerous talking heads (mostly theologians), and Bonhoeffer's friends and relatives. As Doblmeier notes in the interview included as an extra with the DVD, many of the interviews with Bonhoeffer's intimate associates (such as, most prominently, his pupil and friend Eberhard Bethge) were the last that they would ever conduct before they died. This in itself serves as a justification for the documentary; it serves as a record of their last thoughts of their friend, older relative, and mentor. We get a sense of the touching human relationships this man enjoyed. We learn that he knew the weaknesses of his friends and indulged them when appropriate (“I liked chocolate and he brought me chocolate”, Bethge tells us). It is a seemingly trivial point and yet it goes toward the veneration that all interviewees demonstrate toward the subject of the documentary. A more touching episode is recounted by Bonhoeffer's sister-in-law when she relates a meeting between the theologian and his fiancée in a prison; the young woman, unable to restrain herself and against the commands of the guards, flings herself toward her betrothed to embrace him before he returns to his cell. These are beautiful stories and doubtless they are representative of the joys and losses experienced by so many during the Nazi rule of Germany. Additionally, the documentary tells the parallel story of the changes that the Church in Germany underwent during roughly the first half of the 20th century. The German Church was a fervent advocate of the First World War and when the war effort collapsed, so did the faith of the German people. The Church was in a crisis; it had lost its credibility and its congregations. This goes some way toward explaining (but not justifying) the fact that the Lutheran Church, and later, the Catholic Church, as well, came to embrace the Nazi regime. Hitler, in a sick twist of history, imbued the German Church with a renewed sense of legitimacy and direction. 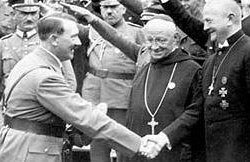 Hitler centralized the organization of the Lutheran Church and even brought the Catholic Church to heel. There is perhaps no more chilling footage of the rise of Nazi power than the images of robed priests giving the Nazi salute and the pictures of a wedding taking place while the vestibule of the church is draped with Nazi flags. Indeed, the film's greatest success, in my opinion, derives from its fascinating ability to present surprisingly fresh footage of Hitler and the Nazis with respect to their appeals to religion and a deity concerned with the steady advance of German nationalism. Who would have thought that there was footage of the Nazi regime that had not already figured in countless documentaries? And yet, here it is. In a particularly arresting scene, we witness Hitler speaking to a large crowd about God's interest in the furtherance of German concerns and the idea that the Nazis had restored the faith of the German people. "No, God" Hitler apotheosizes, "the German people have become strong again in their spirit, strong in their will . . . Lord, we do not let you go. Now bless our struggle, our liberty, and with that our German people and our fatherland." The strange ambivalence of Hitler's rhetoric here is striking. On the one hand, he lays claim to the endorsement of the deity and the fulfillment of His will but on the other hand, Hitler apparently implies that he vouchsafed the deity's support through force ("we do not let you go"). Then he commands God to bless their struggle. Bonhoeffer seems to have had little trouble seeing through such bloated rhetoric. In 1933 (the very year of Hitler's ascension to power), Bonhoeffer wrote, in a radio address titled "The Younger Generation's Changed View of the Concept of Führer": "Should the leader allow himself to succumb to the wishes of those he leads, who will always seek to turn him into an idol, then the image of the leader will gradually become the image of the misleader. This is the leader who makes an idol of himself and his office and who thus mocks God." This rather prescient statement anticipates the later notion that Hitler had inaugurated an aesthetics of power wherein the state became a bloated form of theater, a social rite carried out in plain view that justified atrocities as the necessary sacrifices that all such rites entail. Although, as students of World War II, we recognize Hitler's totalizing concept of authoritarian control, nevertheless we often forget that Hitler marshaled religious fervor to his aide, as well. This film is a healthy reminder of that fact. Given all that the documentary does right, it seems almost petulant to lodge genuine complaints against it. It is a most well-intentioned film and a lovingly rendered, serviceable introduction to the remarkable life of Dietrich Bonhoeffer. But ultimately, that is the very problem with the film. Bonhoeffer's life was not remarkable because he was a Nazi resister. There were others who played much more prominent roles in the various plots to depose the charismatic Nazi leader. Indeed, the film betrays certain rather surprising gaps in its narrative even with respect to Bonhoeffer's involvement in the resistance. For instance, since he was such an outspoken critic of the Nazi regime, how did he manage to get permission to work as a spy for the Abwehr? Certainly this is an important piece of information, but the documentary does not even register it as a potential difficulty. Surely, the Nazis were not so lax in their security. Insofar as Bonhoeffer ought to be remembered, however, it is for his explorations, documented in his theological writings, of the relationship between the Word of God and the deeds of man. In this regard, I am afraid, the documentary fails to deliver. Ultimately, though, I cannot help but find such a strategy an unfortunate mistake. The film repeatedly portrays Bonhoeffer as a man forced by political turmoil into reconsidering his understanding of the strictures of God and the requirements for an ethical life. But it would be more accurate, and certainly more charitable, to view the trajectory of Bonhoeffer's thought as impelled by theological concerns more than biographical ones. From the beginning of his studies, Bonhoeffer was influenced by the most important theologian of the twentieth century, Karl Barth. Barth's belief that the church was the worldly manifestation of the being of Christ is the foundation of Bonhoeffer's theology. The notion that the community of believers is the instantiation of the theology of Christ (particularly, in the most idealistic sense, the Sermon on the Mount) serves as the cornerstone of Bonhoeffer's belief system and he arrived at this notion before he began to defy the Nazi regime. The point here is more than biographical. To reduce Bonhoeffer's theological vision to the status of a reactionary movement is to vitiate its significance and its impact. The film does further damage in this regard by citing only the most accessible ideas from Bonhoeffer's writings without engaging his thought on anything more than a superficial level. His concepts are taken out of context and divested of the overarching vision that made them meaningful in the first place. To treat Bonhoeffer's endeavors in this fashion is to do a serious disservice to his laudable contributions to theological thought. Perhaps Doblmeier felt that a documentary film was not the appropriate format for an in-depth study of theology. But this then leads one to ask why he would have chosen Bonhoeffer as a subject in the first place. Actually, he clarifies this point in his interview when he informs the viewer that he first found interest in Bonhoeffer because he had read Bonhoeffer's prison writings at a relatively young age. These writings served as the inspiration for the making of the film and yet the film itself demonstrates little real understanding of this work. Thus, the documentary leaves the viewer in an odd position: on the one hand, we want to admire Bonhoeffer in the manner the filmmaker clearly intends but on the other hand, we cannot help but question the purpose behind a 90-minute discussion of one of many Nazi resisters. The fact is that we are not particularly interested in Bonhoeffer as a Nazi resister but rather as a Nazi resister who held certain innovative theological concepts. The film assumes precisely that which one should expect it to demonstrate: that is, the reason why we should find interest in Dietrich Bonhoeffer at all. Simultaneously a beautiful study of human life mired in great adversity and a lost opportunity for revealing the intricate depths of theological thought in Nazi Germany, this film ultimately sacrifices its greatest potential asset: the wonderfully rich theological writings that justify Dietrich Bonhoeffer as a subject suitable for general interest.